There's Always Another Utah Destination! Have You Seen Utah? Few Can Say They Have. There's Always Another Utah Destination To Discover and Explore! There's always more to see and do, more of nature's splendor, more awe-inspiring sights around every corner. This should not come as a surprise in a state that puts an exclamation point after it's name on official maps and documents. What's the most amazing hike you've done in Utah? I think everyone would find it very difficult to choose any one Utah destination they most want to see. One should definitely visit the many, very popular National Parks; Zion, Bryce Canyon, Arches, Canyonlands, Capital Reef to name a few. While every one of these parks is amazing, here are some lesser known but equally magnificent scenic attractions that you won't want to miss. 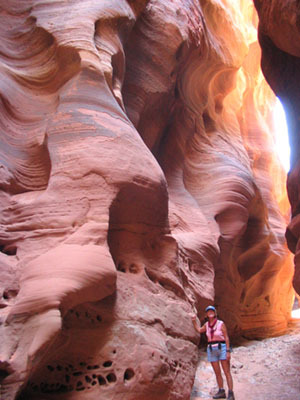 Have You Hiked Through Buckskin Gulch? 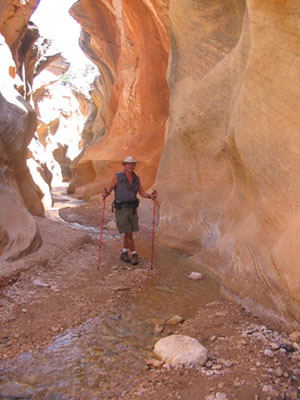 Hiking the amazing Buckskin Gulch slot canyon. Only minutes away from Page Arizona and the famed and much publicized Antelope Canyon, the Buckskin Gulch slot canyon is every bit as fascinating, and far more accessible. Buckskin Gulch - A lesser-known Utah destination. At nearby Antelope Canyon there is a $6.00 per person fee to enter Navajo land. Then, on top of that, $15.00 per person to tour the upper canyon, plus $13.00 per person for entry to the less popular lower canyon. The fee gets you access for only one hour, with a mandatory guided tour so you're with a group of other people the whole time. Meanwhile, at the nearby, equally amazing, Buckskin Gulch, you also pay for an entry permit at the trailhead. However, here, the total cost is $5.00 per person, no parking fee, you can take your sweet time - all day if you like, hike as far as you like into the canyon, and aside from passing a few other hikers, you'll have plenty of solitude. 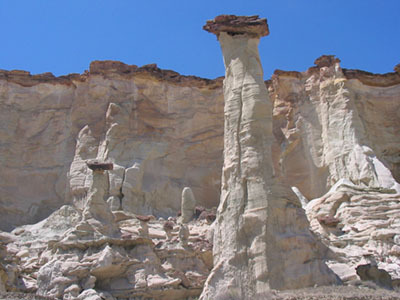 Have You Photographed The White Hoodoos? 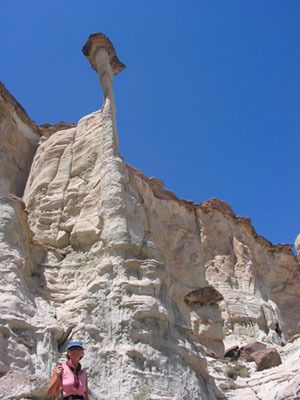 These amazing white spires are capped with a harder rock to form mushroom - like hoodoos. 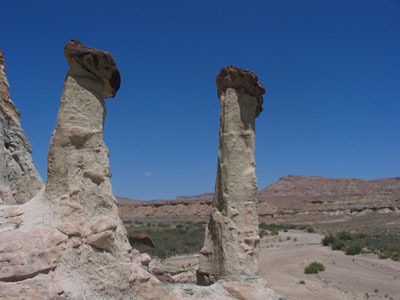 The White Hoodoos rock spires towering above me. 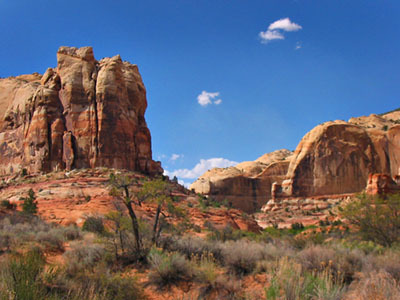 This Utah destination is located in southern Utah, near Big Water, and is not far from the road to Buckskin Gulch. The only way to get to this enchanted garden is by a 9-mile-return hike through Wahweep creek wash. The hike is flat but through gravel, and is considered moderate, however long enough to eliminate most tourists. On a beautiful day in April, we met only 2 other people. Have You Explored Dinosaur National Monument? 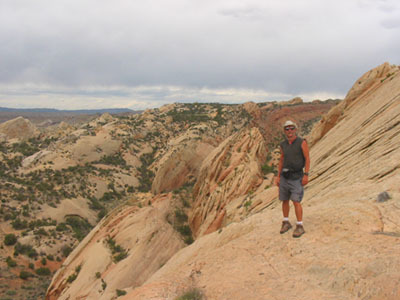 Dinosaur National Monument offers much more than just dinosaur bone exhibits. 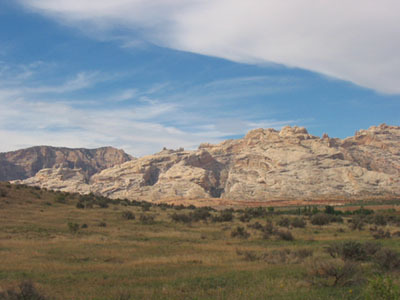 Near Vernal, this Utah destination is on the Colorado border in the northeast corner of the state. Actually, while it has a separate entrance, half of the park, lies in Colorado. The park protects a large concentration of dinosaur fossil bones. The building that displays the bones has been built around the quarry rock wall where the bones are exposed exactly as they were found. Hiking at Dinosaur National Monument. I look like one happy hiker! Most visitors come for the dinosaur display, but the scenery of canyons and twisted strata in the park is unparalleled. With almost nobody using the trails, the hiking is ideal! 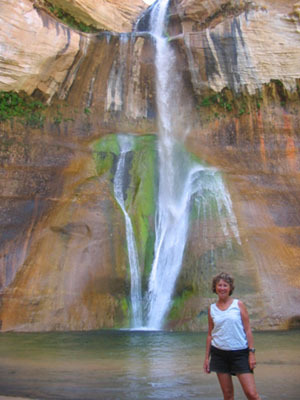 Have You Dipped In The Pool At Calf Creek Falls? 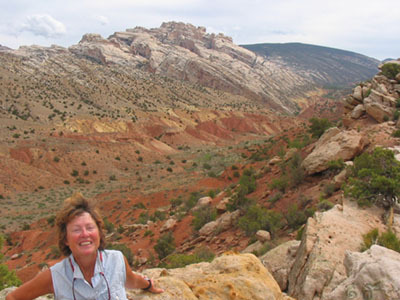 This Utah destination is at the northern edge of Grand Escalante National Monument. The Lower Calf Creek Falls Trail used to be a hidden gem. Although it's still relatively unknown, it has gained a lot of popularity in the last few years. More so than the other attractions I'm listing here. I can't, however, resist mentioning it because, with all the hiking we've done, in my opinion, this is the best hike in the entire Southwest! My criteria for judging a hike? The distance and difficulty compared to the rewards, both en route, and at the final destination. The gorgeous falls may be the destination, but the journey on this moderately difficult 5 1/2 mile-return-hike is every bit as exhilarating, with something new and marvelous around every turn. 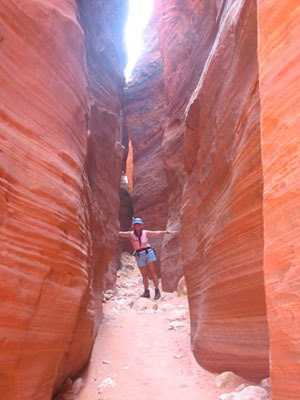 Have You Fallen In Love With Slot Canyon Hiking? Hiking Willis Creek Slot Canyon. Willis Creek, another Utah destination, found just south of the town of Escalante, is an example of the many hidden slot canyons in Southern Utah. Because of the soft sandstone required to form a true slot canyon, Utah has the densest population of slot canyons in the world . There are actually over one thousand slot canyons south of Interstate Highway 70 alone in Utah. Outside of Southern Utah, slot canyons are a rare find. 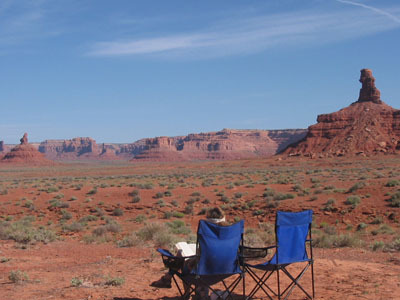 Have You Camped (For Free) At Valley Of The Gods? At first glance, you might mistake this Utah destination for Monument Valley, which spans from Utah across the Arizona border. And you'd be very close to right. The formations are so similar because, in fact, from Valley Of The Gods, the spires of Monument Valley can easily be seen in the distance. So, in effect, the same forces of nature that shaped the Navajo owned Monument Valley created this area, which is administered by the BLM. I guess I can live with this scenery from my free campsite. 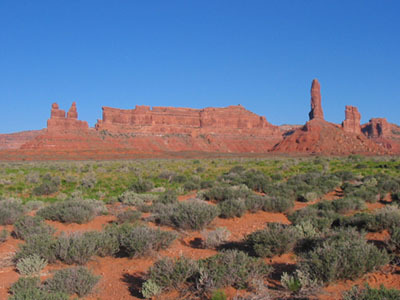 Because Valley Of The Gods is BLM land (Bureau of Land Management), it's open to free camping for all who discover it. As you can see from this open view, it's still relatively undiscovered. It provides a perfect example of the kind of free camping options we've discovered, not only in Utah, but also through the entire American Southwest. Of course, as I mentioned earlier, this is just a teaser page. The Frugal Shunpiker's Guides will give you directions to the many other scenic free camping locations we've discovered. 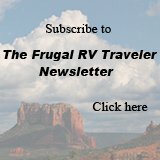 In fact, the guidebook will direct you to at least one free or very affordable (under $10.00), camping option near every Utah destination listed on this page, plus many more. This web page has given you just a taste. There are many other fantastic hidden gems in Utah to tell you about. They'll all be in the Utah guide which I'm in the process of writing. Frugal Shunpiker's Guide in hand, perhaps you CAN , one day, come close to seeing ALL of Utah!